A 1960s Themed Secret Agent Lounge Party. Wear your best 60s attire. See all new works from Dr. Sizzle, Celeste Giuliano, Mike Bell and More. Artwork and other Swanky gifts! More info below. Find the double agent carrying the brief case and ask them for your secret mission. It could be any number of activities to complete for a chance to win cool prizes and SPY GADGETS! LADIES INTERESTED IN ENTERING THE BOND GIRL CONTEST ? 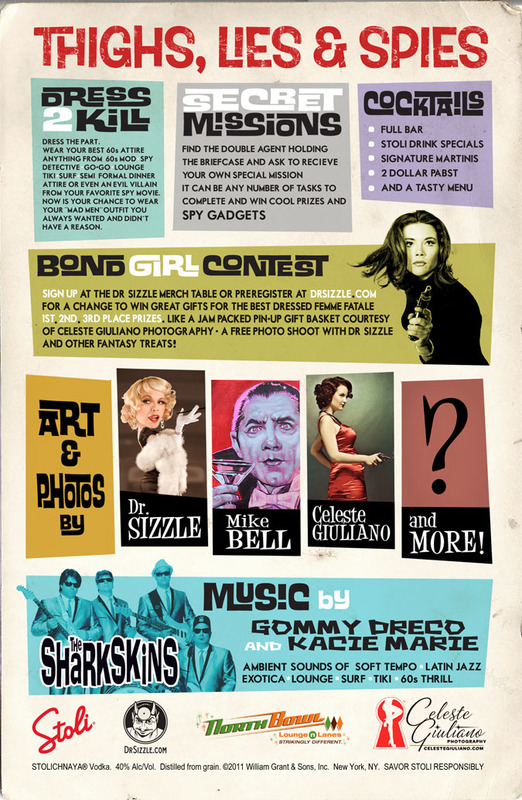 It's simple, just come dressed in 60s style attire Can be anything from GO-GO, Tiki, Secret Agent, Femme Fatale. Sign-In at the Dr. Sizzle merchandise table the night of the event. Or you can preregister below. We ask that all registration be in before 10pm. Each ladyl will have a number and strut their stuff down the walk in front of a panel of judges, turn and go back. Each contestant will be judged on her Hair, Makeup, Outfit, and overall Attitude..
1st place winner gets a Jam pack gift basket courtesy of Celeste Giuliano Photography. 2nd place winner gets a free photoshoot with Dr. Sizzle resulting in a really cool work of photoart. 3rd place recieve a special prize to be announced at the event. The Contest is open to all females 18 and older. Send an email including your First and Last Name and your email address to be put on the pre registered list. Once registered you will still need to check in at the Dr. Sizzle merchandise table to recieve your contestant number.